You are at:Home»Columns»Uncle DI»A Maphilindo pact in the offing? A Maphilindo pact in the offing? NOW that there will be three against one, can we say confidently that their days are numbered? By ‘their days’ I mean those of the Abu Sayyaf, the Filipino armed group, based on the islands of Basilan and Jolo. This is a group notorious for abducting, for ransom, sailors on the Sulu Sea and foreign tourists from island resorts in Sabah. The three countries are our own beloved Malaysia, Indonesia and the Philippines, now working out, together, on a security arrangement by which to reduce and eventually get rid of the scourge of the sea: business in humans including killing them if the ransom is not paid to the abductors or their agents on time. Abu Sayyaf is an offshoot of what started off as a political movement in the 1960s for the entire Muslim community of southern Philippines. Armed outfits calling themselves by various fronts – Islamic or Liberation, even Bangsamoro Republic (2013) – were leading the liberation movement but they soon quarrelled among themselves over the leadership and direction of their struggle. There were those opting for autonomy within the Republic; others for a total breakaway from it; yet others chose an old profession which is more lucrative: piracy. Recently, this last splinter group has pledged allegiance to the Islamic State fighters in Syria and Iraq. On one fine day, they hope to establish the Eastern Caliphate, either somewhere in southern Philippines or in the Celebes. It is the presence of the elements of this terrorist organisation at our doorstep that compounds the security problem in this part of the world. This is a real threat not only to the security of Malaysia but also to that of the Philippines and also that of Indonesia. Therefore, the three countries must address this threat sooner rather than later; they must pull their resources together in order to rid the area of the Sulu Sea from piracy as well as to nip in the bud the creation of the caliphate of the Islamic State from taking permanent roots in our part of the world. The trilateral security cooperation announced by our Defence Minister last month has relieved us of frustrations over the apparent difficulty of dealing with the nefarious activities of the Abu Sayyaf’s on our side of the border with the Philippines. On our own these nefarious activities are difficult to handle; some cooperation from another country is necessary. Now there are three of us and thus we should be able to combat the menace successfully. The cooperation between the neighbours is long overdue; this latest news about the trilateral security arrangement in the Sulu Sea is better late than never. It is the right step towards solving or reducing the incidents of abductions for ransom on that Sea. I’m not interested in the details of the security cooperation. They should be kept secret lest the Abu Sayyaf’s agents pick up the strategies to their own advantage. I should imagine that a kind of pact is necessary for the smooth implementation of the arrangement between the trio. There will be appropriate terms of reference and the related protocols, before joint patrols by air and by sea can start smoothly. Meanwhile, those using that sea east of Sabah should take extra precaution – stay safe by staying as near the shore as possible and within the sight and surveillance of the Eastern Sabah Security Command. The Abu Sayyaf and their agents are monitoring what we are doing and may just want to prove the point that they are still a power to reckon with by snatching someone away. Touch wood. I am more interested in the result of the implementation of a standard operating procedure once adopted by the partner countries. Let’s say an abduction by Abu Sayyaf of any national using the Sulu Sea occurs once the security cooperation is formalised. Life would be easier if the agreement should make it impossible or not that easy for the abductors to slip across the sea border with impunity. Now there’s someone waiting for them on the other side of the line on the ocean! On three sides! How will they escape the net? Hopefully, there will be less and less abductions and eventually zero beheadings as a result of the plugging of all the current loopholes in the strategy to prevent abductions by the gang, making the work of the Esscom so much easier and less frustrating. There is no reason why such an arrangement cannot work if there is good rapport and trust between the enforcement agencies of the three Asean countries. The right of hot pursuit may not be necessary if there is an instant sharing of information as to the whereabouts of the abductors at any particular time and place – on the high seas or in one of the numerous islets. There’s nowhere else for the culprits to hide for long before being caught by the respective authorities in place at strategic spots. Nowadays, the use of drones and other surveillance gadgets during daylight, and, at night there will be joint patrols – these are effective tools the use of which of we can say we are ahead of the Abu Sayyaf. Effective cooperation in the use of these tools will spell real trouble to the abductors; indeed, it will be the beginning of the end of the Abu Sayyaf’s lucrative business in human abductions. 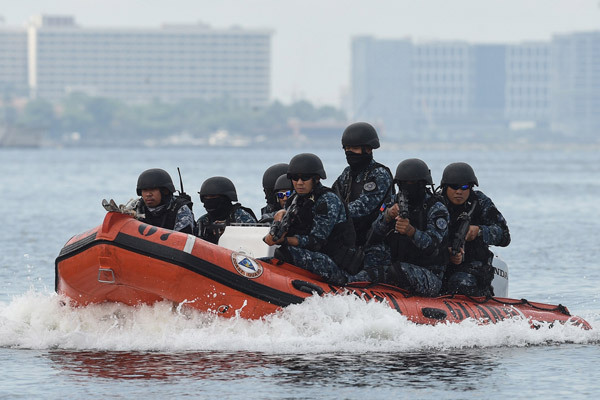 The joint patrols by the three countries by sea should also be given the necessary power and authority to detain drug smugglers that they may encounter on the high seas. Thinking of the drug problem in Lawas, I’m curious, is this problem among some people in the district a mere coincidence? Has it nothing to do at all with the smuggling of drugs via the Sulu Sea from the Philippines to Sabah and from Sabah to Sarawak beginning at Lawas where there appears to be a demand for the stuff? Where else can the drugs come from or go through? Does this theory of mine make sense when the two – beheadings and drugs – are read together, with reference to how the Abu Sayyaf handle their victims?